We all like to think that given the opportunity to blow the whistle on something illegal or immoral, we would do the right thing. But whistleblowing is rarely, if ever, black and white and often entails significant legal, ethical, financial, and personal challenges. Federal employees and contractors who report wrongdoing put their careers and livelihoods at risk. Former coworkers shun them. It may be exceedingly difficult to find new work in the field. And most whistleblowers don’t have movies made about them. 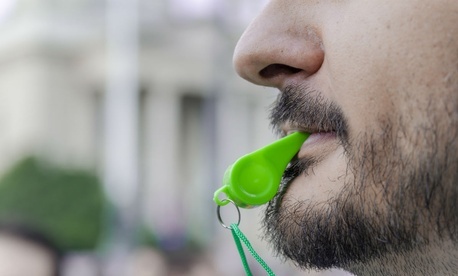 To blow the whistle on wrongdoing takes courage and can be an act of immense patriotism. It could save lives, defend our constitutional rights against government overreach, and help preserve our democracy. During the past few months, a number of articles have been published about the legal protections afforded to federal employees who blow the whistle and face retaliation. But if someone is thinking about coming forward, they should make sure they fully understand their rights and responsibilities. If I blow the whistle, how do I avoid retaliation and maximize my chances of professional survival? What methods should I use to make a protected disclosure? Email, phone, encrypted apps, letter? To help federal employees and contractors find answers, the Project on Government Oversight has launched a free training program. The Federal Employee Rights Training Program is designed to educate employees about tactics to safely and meaningfully disclose information through protected channels and apprise them of the protections that exist in the case of retaliation. Federal sector employee speech is more susceptible to chilling if employees do not know their rights. The hour-long training sessions include at least one POGO employee with experience working with whistleblowers and an outside attorney who specializes in federal employment law. While they include references to legal information, the training does not constitute legal advice. POGO itself was founded by Pentagon whistleblowers in 1981 who were concerned about the Defense Department’s procurement of ineffective and overpriced weapons. Over the years, it has worked with insiders and whistleblowers to expose waste, fraud, abuse, and other wrongdoing across government. For more information, including ways to contact POGO securely, we offer specific guidance on our website. Nick Schwellenbach is director of investigations at the Project On Government Oversight. Previously he was communications director at the U.S. Office of Special Counsel.